Uncanny! 20th Century Fox, Marvel, and TSG Entertainment’s Logan is a compelling, grizzly, organic superhero movie that is the last to feature Hugh Jackman as Logan (Wolverine) and Patrick Stewart as Professor Charles Xavier. Prepare to have your mind blown as the action unfolds in such a way that your heart will be pounding, racing, and pumping adrenaline through your body and then tug at your heartstrings as emotions run high. Logan is quite possibly the most comprehensive and diegetically dynamic superhero movie ever, and perhaps best X-Men film in the long, successful franchise. With a penchant for thrilling, action, and even horror films, director James Mangold pulls out all the stops in the last chapter in the story of The Wolverine. While there have been several films about Logan/Wolvervine outside of the main X-Men films, this cinematic adventure will have you on the edge of your seat with anxiety and holding back tears simultaneously. Some of the responsibilities of the final chapter of a character or an actor portraying a long-standing character are striking a delicate balance between nostalgia, closure, but still providing audiences with a new story; overwhelmingly, this film delivers the absolute best as we bid farewell to Hugh Jackman and Patrick Stewart from the X-Men universe and exceeds any and all expectations. In the not too distant future, an aging Logan (Jackman) is caring for an increasingly ailing Professor X (Stewart) near the US/Mexican border. With the professor’s cognitive health in a downward spiral, Logan illegally acquires medications that ease the Professor’s seizures…seizures that are telekinetically powerful enough to leave devastation in their wake–and have. 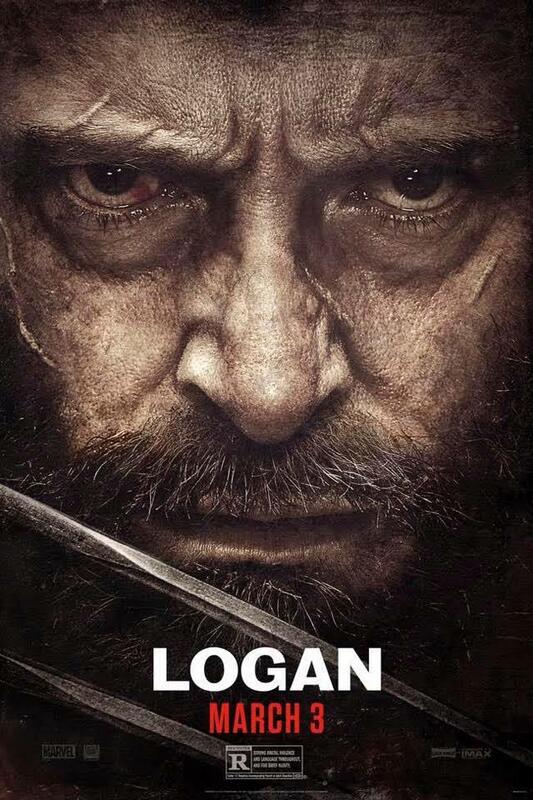 Logan is challenged to hide the Professor from the world in an effort to shield him from those who seek to kill him. While operating as a limo driver, Logan encounters a bizarre woman at a funeral who begs for his help. As Logan has always been the solitary type who mostly cares for himself, he ignores her cry for aid. In a bizarre turn of events, he finds himself caretaker of her daughter when she is found dead in her hotel room. After she follows Logan to the hideout, Professor X pleads with Logan to take her to a place called Eden. This soon becomes a bloody road trip as the three of them hide from and attempt to outrun those who want to kill Logan, the Professor and take the girl back to Mexico. What do James Mangold’s 3:10 to Yuma and Logan have in common? They are both grisly western films. Evidence of this is not only seen in the character development, pacing, and overall tone of the film, but can also be seen within the film itself as Professor X and Laura (Dafne Keen), the young girl traveling with Logan and Xavier, watch a western film on TV–a film that Xavier references several times as he reminisces about films from his childhood. While many think that the American Western film died out with Hollywood Golden age, it has certainly not retreated from cinemas. In fact, many of Quinten Tarrantino’s films are westerns, the original Star Wars: A New Hope was a post-modern western, and Mangold’s Logan is yet another example of a reimagination of the American Western film. Reading the film as a western enhances the visceral experience of the film. Although directors seldom pit cowboys against indians anymore, there are subtle references to that relational dynamic from early western movies within this film. Much like the Lone Ranger and many of John Wayne’s characters, Logan is also a solemn solitary character being pulled into a world built upon the idea of relationships but his baggage makes it incredibly difficult. Emotions run high in Logan; and it’s these emotions that provide audiences with a comprehensive experience that fulfills the desire for gritty action plus moments that may stir you to tears. Although we are just coming out of this year’s award season, it’s entirely possible that Logan may be the first superhero motion picture to be nominated and even win Best Picture at next year’s Oscars. All the elements that make up a Best Picture nominee can be found in Logan. It has drama, romance, a little humor, feels organic, deals with prejudice (by extension), and is based on a book–a comic book that is. The R rating is also important because it (1) serves as further evidence in the direction Fox is going to proceed with films like Deadpool and X-Force–gearing toward an adult audience (2) it allowed for audiences to see the Wolverine at full bloody force, which has been a desire for quite sometime and (3) the degree to which the film can deal with real adult problems physiologically and emotionally. The financial success of Logan will depend on adult audiences speaking the word about the outstanding nature of the film and even bringing more mature younger superhero fans to see the movie. Since most of the film contains disturbing imagery in regards to both the bloody violence and with Professor X’s debilitating cognitive disorder (most likely a severe form of dementia), I would not recommend bringing those under 13 to the film until you have screened it for yourself. It’s an incredible, film; but, there is content that may not sit well with those that are quite young. Before Logan begins, fans of Deadpool will be excited to know that there is a short film (glorified promo, really) for Deadpool that does a successful job at promoting the highly anticipated sequel to last year’s blockbuster. Its placement is also important to Logan in that it provides some levity before the rather somber tone of the feature film that follows Ryan Reynolds’ offensively endearing witty charm as Deadpool. Logan is proof that superhero films can take the more serious route without sacrificing the art of the story. Both Jackman’s and Stewart’s acting is on point, and probably some of the best of their respective careers. Stewart, more specifically, delivers a command performance as Professor X and demonstrates that an accomplished actor who was primarily first known as Captain Picard can excel in both the horror (Green Room) and superhero genre films, all the while continually adding the touch of class that comes with his formal Shakespearean training as a performing artist. This is NOT repeat NOT a kids superhero movie. Unless you have screen the film first, I would not recommend bringing anyone under the age of 13 with you to the cinema for Logan. There may not be “adult” content in the conventional sense; but, there are themes, subtext, and some violent content that may not be suitable for a younger audience who typically flock to superhero genre movies. Over all, Logan is an outstanding film, not just of the superhero variety, but also in general. From the writing to the directing and technical elements, this movie is a fantastic example of a superhero film that attempts to be and successes at breaking the mold and cementing itself as serious cinema.